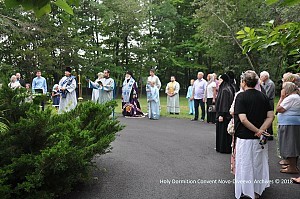 On Monday, August 27, the eve of the great feast of the Dormition of the Most Holy Theotokos, with the blessing Metropolitan Hilarion of Eastern America & New York, Archbishop Gabriel of Montreal & Canada arrived to Holy Dormition Convent "Novo-Diveevo" in Nanuet, NY, to join the monastics, clergy, and faithful in celebrating the convent’s patronal feast day. On Monday evening, Archbishop Gabriel and convent clergy served the All-Night Vigil in St. Seraphim Cathedral with a Litia, followed with the blessing of five breads, wheat, wine, and oil. 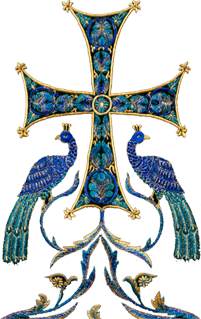 On Tuesday morning, August 28, the feast of the Dormition, the service began with an akathist to the Dormition of the Theotokos and the Lesser Blessing of Water; the greeting of the Archbishop followed. 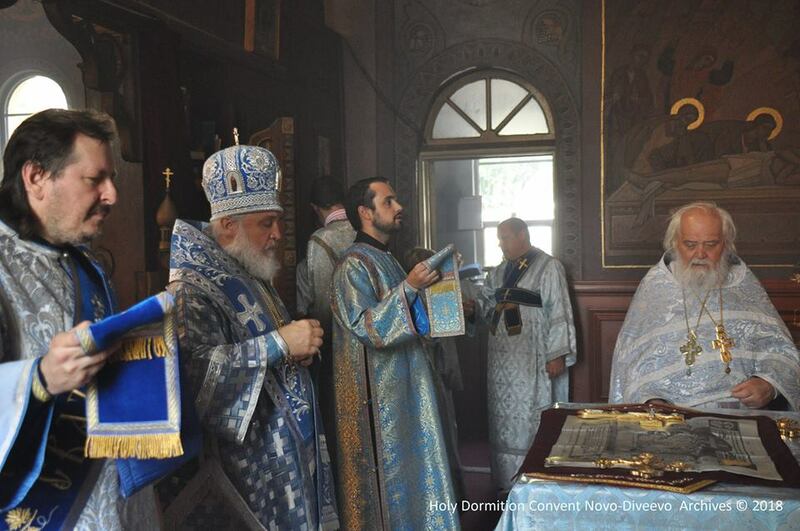 His Eminence was co-served at the Divine Liturgy by convent clergy: cathedral dean Archpriest Alexander Fedorowski, Protodeacon Serge Arlievsky, and Deacon Nicholas Illyin. Praying at the divine services was the convent’s rectress, Abbess Makaria (Fadina). The divine services were accompanied by the pious singing of the cathedral choir. 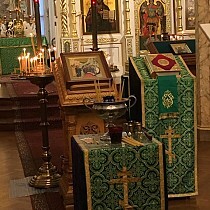 Numerous parishioners confessed both during Vigil and before Divine Liturgy, in order to receive Christ’s Holy Mysteries. Upon completion of Divine Liturgy, Archbishop Gabriel congratulated the clergy, monastics, and parishioners of the convent on the occasion of its patronal feast day. He then delivered a sermon on the importance the Mother of God in our lives, as well as the significance of her holy Dormition. A festal luncheon in the main dining room of the convent’s adult home, where interaction continued throughout the day.